Hi! kind of a stupid question, but as it is tanck technical question and I don´t know the translation, I thought that I´d beter try a "recon by fire" in the fórum and see if by any chance I can find the correct term in english. So, reviewing an old tank manual (in spanish) I did find the term "live" track vs "dead" track. I mean, in spanish. 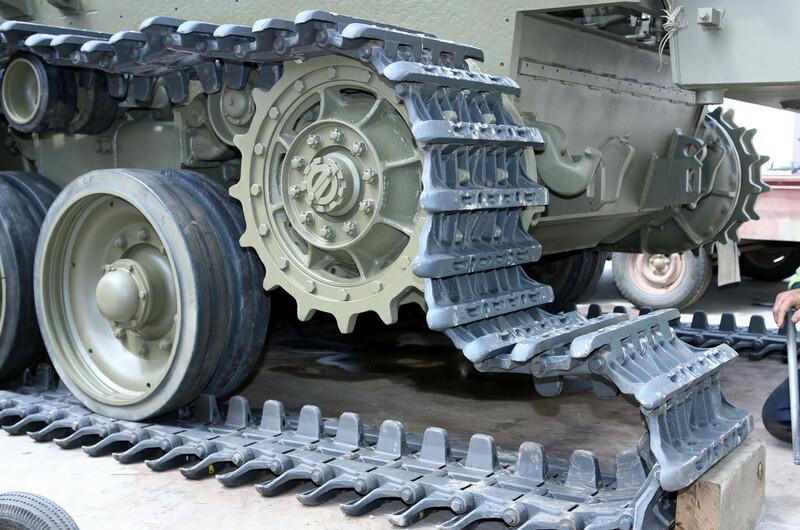 A live tank track is those traks that by design tend to curl. A good example is the track of the M113. So, if you leave the track by itself on the floor the edges of the track will raise in the air, as the track tends to curl. Sorry, it´s difficult for me to explain it in english. On the other hand, a "dead" track, such as the one in the Leo 2, whould remain perfectly flat. So, if someone knows what the hell I´m talking about and knows the proper technical term in english, I´d be grateful. It´s a very technical thing, but I know there are ex tankers here and hopefully this rings a bell in someone. PS. I´d love to attach a picture, but as I don´t know the term in english and 90% of the pictures on internet are referred in english, I was not able to find any. M113 = Live track, the track is "sprung". Centurion and most T tanks, earth moving equipment, etc. = Dead track (no rubber bushes, just metal on metal). When I was an M113 driver, when the terms were used in our motorpool, 'dead' track shoes were those whose bushings had worn to the point that they needed to be replaced. Checking the space between the shoes with an oddly shaped gauge to measure the amount of wear was part of the operator's level PMCS checks. that was easy! and fast! makes sense, I guess that our official term was translated directly from english. yeah, I guess that dead can be used also for "no longer working", etc.. In Spain is also used in that sense, although I´d say that more in a coloquial language. Thanks for answering! Apart from the "dead" = "unserviceable" definition (which is used here too, primarily in the vehicle compound), I think the "Live" vs "Dead" difference is based on the bushing. On say a older M113, not fitted with Diehl track, the track "pin" (our terminology) is hexagonal. The track "links" (our terminology, I know some other armies use "shoes" or "plates") both have bushes with hexagonal openings. When you join the track the hexagonal holes (on each piece of track link) need to align before you can drive the pin through - incorrect alignment results in "lumps" in the track when its run out on the concrete. "Dead" track tends to just have circular holes and a circular pin, so there isn't the same issue. That´s exactly right, gibsonm. I guess that the Word "live" is used because this kind of traks looks like they move by itself when you set it free, as if it was alive. Yes I think (been a while since I did my driving and servicing course) it relates to the tension in the rubber bushes as the various track links push against each other, whereas as dead track is just a hinge (like on a door).